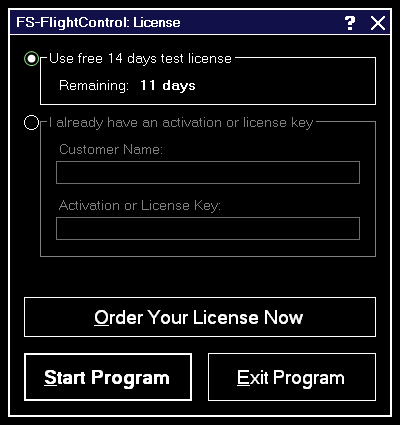 Use this dialog to enter your FS-FlightControl license information and activate the product or check how long your test license is still valid. Here you can see how long your test license is still valid. Note: You can even still start the program after the test license has expired, but then it will close automatically after 5 minutes. After your purchased your license, you can enter your activation data into this section. Note: If you want to switch your license from one computer to another, just deactivate your license on the old computer in the Info module first.